I make (and eat!) TONS of hummus. When having friends over for a Middle Eastern themed meal, I made this fabulous classic appetizer to serve alongside hummus. My husband and I could devour an entire bowl if we allowed ourselves! It reminded me that I need to make it more often- even though it takes much longer to prepare than hummus. This is my favorite recipe, adapted from the Moosewood Cookbook by Mollie Katzen. We served it with pita chips, flatbread, sugar snap peas and baby carrots for dipping. Preheat the oven to 350 degrees. Cover a baking sheet with foil and spray with cooking spray or lightly oil. Slice the eggplant in half lengthwise, and place face-down on the baking sheet. Bake for 30 to 35 minutes, or until very tender. Cool until comfortable enough to handle. Meanwhile, prepare the “mix-in”. Heat 1 T olive oil in a medium skillet. Add the onion, mushrooms and salt and sauté 10 to 15 minutes or until tender. Remove the mushroom mixture from the heat and stir in the fresh dill. Set aside. Scoop out the cooled eggplant pulp, and discard the skin. Place the pulp in a food processor, and add the garlic, lemon juice, tahini, salt, and pepper. Puree until smooth. Transfer to a serving bowl and stir in the mushroom mixture. Cover tightly and chill. Before serving, the top can be drizzled with olive oil and sprinkled with chopped parsley. Serve with crackers, pita, flatbread and/or crudités. Big hummus fan here, also!! 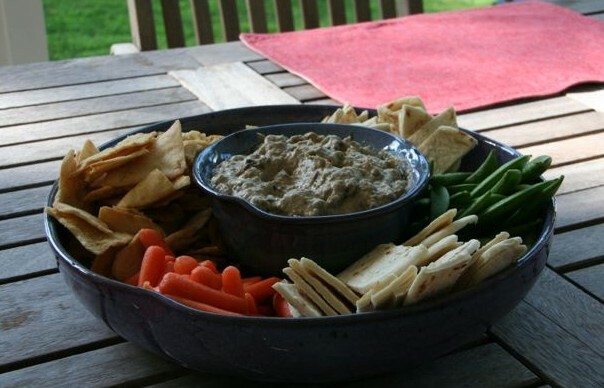 Hummus is such an easy appetizer and always a crowd pleaser. Fantastic recipe on Baba Ganoush.